In the Jaw Bush principle, tooth and space width are staggered by a certain measure. In the relaxed state, the bush is ovesize to its housing bore. However, upon insertion into the housing bore, the compression of the bush within the elastic limit of the hardened material allows the teeth to touch on one side. The perspective view shows that the tooth flank pressure results in a tangential force. 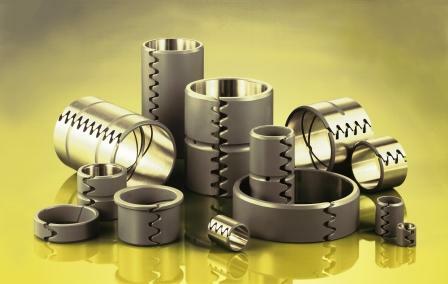 In combination with the radial acting spring force, a higher contact pressure results between bush and casing. The higher the ratio between bush wall thickness and diameter, the more active is the surface pressure. The toothed slot allowing for a nearly closed surface in the slot region, gives a good all round bearing. Slot position is as a rule important. This principle results in an increased seating capacity of the Jaw Bush in the component bore. Insertion and pressing out are easy. Harmful tensions, seating and assembly problems, associated with plain bushes, can be avoided. Higher wear resistance chrome-vanadium spring steel is used for the standard Jaw Bushes. For special applications in corrosive medium, hardened INOX steels are used. For increased quality and precision, Precision Jaw Bushes with ground and fine turned surfaces will meet the requirements. They all correspond with the works standards. Grease grooves and channels can be incorporated on both Bore and OD. We recommend case hardened steel shafts for use with Jaw Bushes, as it is the wearing part and easily replaced, thus preserving the load carrying component. Shoulder/flanged Bushes are offered as a special. The Jaw Bush is generally a cost saving machine element, judged on its purchase price. We offer full technical support and drawing information to the design engineer.